Acorn Energy Solar One (AESO) is a group net-metering project that is a collaboration between the Acorn Energy Co‐op, the Town of Middlebury, and Co-operative Insurance Companies. They work to promote renewable energy and energy efficiency for people in Addison, Rutland, and Chittenden counties. While the Acorn Energy Co-­op developed the concept for a group-net-metering project, they created a separate entity - AESO - to manage the project. The planning stages for this group-net-metering project began in June 2010, when Acorn Energy Co-­op began to look for a suitable site to house the solar array. By June 2011 they had signed a lease with the Town of Middlebury to occupy a previously unusable patch of land owned by the city, directly behind the Police Station. The site is a decommissioned sewage treatment plant. Their next step was to find the funding for the project. Members of the Acorn Energy Co-­operative provided some of the initial funding for the project and the Co-­operative Insurance Companies provided the equity investment in July of 2011. Once they had officially formed the Acorn Energy Solar One, LLC, the group secured financing from the Vermont Economic Development Authority (VEDA) and the National Bank of Middlebury. The financial process closed in October 2011, and construction began in November 2011. The construction on the ground for the project only took 39 days. 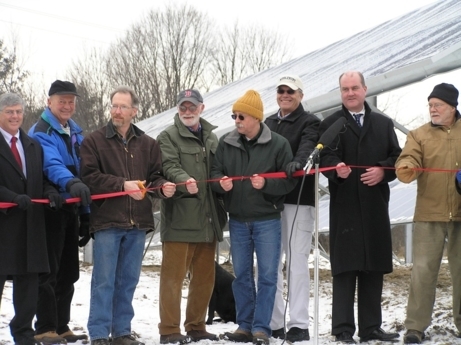 By the end of December 2011, the array was up and running. In total, the project cost $666,000. It is a 147.8 kW array, with 528 280-watt panels. The life expectancy of this project is over 25 years, with a production of over 172,000 kWh per year. The three main participants (Acorn Energy Co-­op, the Town of Middlebury, and the Co-­‐operative Insurance Companies) each receive a third of the energy produced. The amount allocated to the Acorn Energy Co-­op is then further divided and used as credit on utility bills among sixteen separate member households. The project has been immensely successful, and plans are in the works for another, similar group-net-metered project to be built in either Rutland, Addison, or Chittenden counties. Develop a timeline, with reasonable yet ambitious goals. Financing and securing a site took longer than the actual construction of the project. Be sure to keep momentum throughout. Consider a diverse group of stakeholders in the project. While making it a commercial project and investment isn’t for everyone, it can create a whole new realm of possibilities in terms of size, scope, and location of the group net-­metering project.